Next June's supercharged MINI Cooper S will have 163bhp, not 155bhp as originally thought. Together with a six-speed gearbox, this will be enough to get it from zero to sixty in around seven seconds and on to a top speed of 135mph. Similar performance to a late 1960s SII 4.2 E-Type Jaguar. Apparently, fuel consumption will not suffer as a combined figure of 33.6mpg has already been recorded for the 1,140kg car. Torque is a similarly impressive 155lb ft (210Nm) at 4,000rpm, with at least 124lb ft (179Nm) available between 2,500 and 6,500rpm. 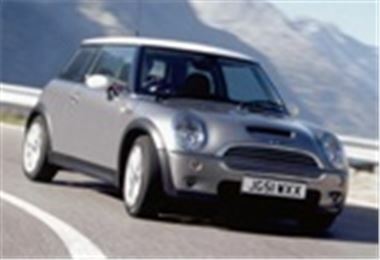 The main external differences between the Cooper S and the standard Cooper are a front bonnet air-scoop, which you can see in the photo, and big sixteen-inch or seventeen-inch wheels (the original Mini had to make do with ten-inch wheels). Run-flat 195/55 R16 tyres or optional 205/45 R17 tyres remove the need for a 'spare' wheel, allowing progress to continue for up to 90 miles at up to 50mph. Electro-hydraulic rack and pinion power steering offers a direct 2.5 turns lock to lock. Automatic Stability Control and Traction Control (ASC + T) is standard. Dynamic Stability Control (DSC) will be an option. If the World hasn't come to an end by next summer, expect prices between £15,000 and £16,000.